The Art of Girl Building from the inside out is an experiential summer program for girls ages 8-14 designed to help them explore solutions to the challenges unique to their age group. The week-long program fosters confidence by helping girls develop their strengths and acquire skills while unveiling hidden creative potential. The week consists of discussion and reflection, group problem- solving activities and an array of art projects including life-size sculptures created from recycled and found objects. 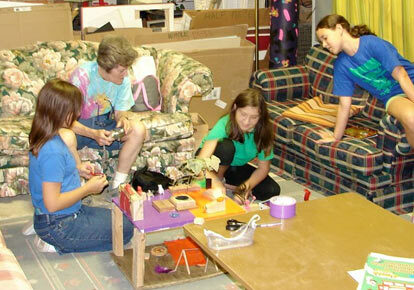 The girls are nurtured and guided through the process by CWI professionals and volunteers. The finale of the Art of Girl Building experience is an artist’s show and reception attended by friends and family. Special thanks to our devoted crew of volunteers who are so committed to making each Art of Girl-Building session a life changing experience that each young girl will always remember. These volunteers are Joyce Lanning, Spring Olson, Jennifer Given, Dicki Arn and Lawton Osbun.